Cash-strapped schools are turning to partnerships with corporate America to increase available funds. 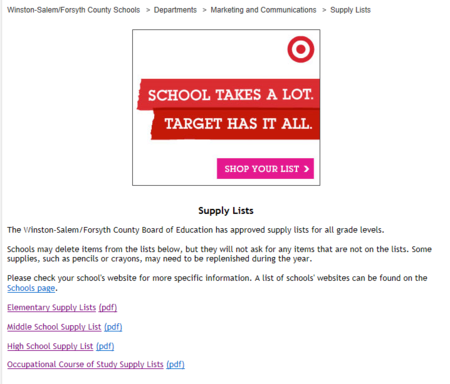 The latest evidence surfaced in a brief news item about Winston-Salem/Forsyth County, N.C., schools’ decision to add a Target logo to elementary school supply lists in return for $9,000. It turns out that a total of 227 schools in five districts in California, Maryland, North Carolina, and Virginia are part of a pilot back-to-school program that the Target Corp. has launched to put its brand on supply lists that are being distributed to students this fall, and on the districts’ web pages displaying the lists. A spokeswoman for the Minneapolis, Minn.-based company said the effectiveness of the campaign will be evaluated after the back-to-school season is over. Education Funding Partners Inc., the Golden, Colo.-based firm that brokered the deal, works to match schools with opportunities to receive funding, in exchange for marketing opportunities at the schools on behalf of Fortune 500 corporate sponsors. “Back-to-school is a very important time for retailers,” said Mickey Freeman, the company’s president and CEO, indicating that four “very large” retailer programs are underway through his firm now, although he declined to name the others, except to say they are comparable in size and scope to the Target project. In Winston-Salem/Forsyth, the school board, which signed a three-year contract with Educational Funding Partners last fall, reviewed the Target opportunity and approved it in May. Some 25,000 elementary students will receive the branded lists, and have access via the district’s website. The message emblazoned in red across the top of the online school supply list links to discounts for Winston-Salem/Forsyth families. “We’ve been through the recession, and education budgets have been cut or have not increased with the pace of student growth. In addition, we’re looking for places to cut. Our board and other boards across the country are also looking for ways to increase revenue,” said Theo Helm, director of marketing and communications for the district. Freeman, who in 2010 founded the company to pair corporations with schools, said that with 14,000 public school districts in the United States, “for a major brand, it’s too difficult to reach them” efficiently. “It’s hard to get the attention of a chief marketing officer for a major company, even for school districts as large as Chicago, New York and Los Angeles,” he explained. Education Funding Partners is working with 150 public school districts representing 10 million students and 16 million parents and educators in 20 states, he said. His company presents districts with opportunities from potential sponsors, but district leadership has the final say over brands, messages, and locations of sponsorship. In Winston-Salem/Forsyth, the school board voted 7-2 to approve the contract with Education Funding Partners, and 7-2 to accept the Target sponsorship, Helm said. In the meantime, Target announced its own “direct-to-the-community” initiative to give away $5 million to schools based on a Facebook voting campaign, the Minneapolis Star-Tribune reports. The campaign has been set up so that at least 500 schools will receive $10,000 each. am afinal year medical student in uganda africa but am having tuition difficulties.i now have atuition debt of $3000 usd to complete my course.can you help me clear my tuition debt.please any help given shall be grately appreciated.